When Kate was a little girl, her mother forced Kate to give up her dolls. Seal them in boxes and store them away. (We only later discover why.) Kate especially hated parting from one doll -- an ugly "guardian doll" given to Kate by her grandmother from the Old Country. A Guardian Doll protects little girls from harm. In the Old Country, mangled bears and wolves are sometimes found outside little girls' homes, with tracks leading from the house. Legend has it that the Guardian Doll has come to life, to kill the nearby threat. Now Kate is an adult, newly married and pregnant and living in Kentucky. Away from her mother, Kate is finally able to unpack her dolls, and fill the nursery with them. Even if the baby's a boy, he'll have dolls aplenty! "You sure have a lot of dolls," hubby Jason comments. Everybody says that to Kate. All should be well so long as Kate is not threatened. But she does feel threatened. Jason's old flame, Samantha, keeps dropping by. Kate is jealous. She learns that Jason's mom was hoping Jason and Samantha would marry. Kate's jealousy grows. She talks to her Guardian Doll. The past decade has seen an explosion of grassroots, independent horror films, many of them dramatically derivative and technically slipshod. Amateurs with a camcorder, but no patience to learn lighting or sound, remaking their favorite Hollywood remakes. Filming their friends in bad zombie makeup, or playing yet another sleazy torturer or sordid serial killer. From this milieu, The Creepy Doll emerges as welcome relief. Nicely composed shots (a rarity in indie horror filmmaking), careful lighting, appropriate mood music, complex characters performed by a capable cast, and an interesting supernatural tale peppered with dramatic nuances. For instance, when the brooding Kate walks by a school, she sees an ominous world -- a man photographing girls at play from behind a wall; another man yelling at a child -- yet these details turn out to be innocent. This scene both unnverves audiences, and supports Kate's character by suggesting that she is overly imaginative. Does she often imagine threats? Does she only imagine that Samantha is a threat? Does she only imagine that her Guardian Doll has real powers? The Creepy Doll is the sort of film where one can debate whether the doll is truly magic, or if it's all in Kate's head. I think the evidence onscreen clearly indicates the former -- and happily, that also makes for a better horror story. 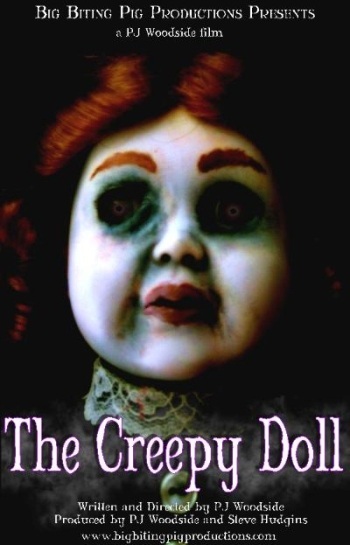 Evil dolls -- be they toys, voodoo dolls, or ventriloquist dummies -- are a horror staple. Among the best are the Zuni fetish doll from Trilogy of Terror and Talky Tina from the original Twilight Zone's "Living Doll" episode. What's so scary about dolls? To paraphrase The Creepy Doll's Samantha, "Some children react badly to things that resemble humans. Robots...dolls..."
The Creepy Doll takes this traditional monster and (as did Absentia) effectively interweaves its supernatural tale (of an evil doll) with a domestic drama (of a jealous wife), so that The Creepy Doll works on both dramatic levels, each supporting and playing off of the other. Kentucky-based Big Biting Pig Production has long striven for originality and quality. Their fifth film, Hell Is Full, featured an experimental, nonlinear story structure, despite its well worn zombies. Their first film, The 3rd Floor (a ghost tale) was a mixed bag in terms of acting, and the lighting was rough. Yet even that crude effort held my interest and entertained, because of its emphasis on character and story. The Creepy Doll is Big Biting Pig's sixth film, their most polished work to date.